MINNEAPOLIS, MN – April 9, 2017 – 612Brew is proud to announce its sixth annual event at the brewery during Art-A-Whirl®, Friday May 18 through Sunday May 20. Located in the heart of the Northeast Minneapolis Arts District at Central and Broadway, 612Brew’s event during Art-A-Whirl® is a celebration of all things that make the largest open studio tour in the United States a can’t miss event, including amazing art, local musicians, food trucks and great craft beer. The 612Brew event during Art-A-Whirl® will feature the art of multiple NEMAA member artists, several food trucks, pop-up tattoo shop and three days of live music on 612Brew’s outdoor amphitheater. During the event, 612Brew will be serving over ten of its most popular beers including: SIX Pale Ale, Unrated Rye IPA, Gateway Park Lager, Outfit Porter, Mary Ann Ginger Lager, Maibock, Cloud Wars Hefeweizen, Shere Khan Indian Spiced Ale, and two new year-round beers, Session Dark and IPA. In effort to promote the members of NEMAA, 612Brew is showcasing only NEEMA members in 2018. Artists include 612Brew, can art and poster artist Dogfish Media, Melinda Wolff, Megan Stuart, Wild Poppy and Paige Hanenburgh. Food trucks include R Taco, Panini Pinups, OHMBrowies, Fabled Rooster, Motley Crews Heavy Metal Grill, Little G’s Pizza, Urban Sub and O’Neil Amusements. Tiger Rose Tattoo will have a pop-up tattoo shop located in the brewery doing flash art tattoos both Friday and Saturday. 612Brew encourages visitors and patrons to browse the local galleries and to purchase local art. Guests who present an “I Bought Art” sticker from a participating Art-A-Whirl® artist or gallery receive $1 off a pint of beer from the taproom during the event. The 612Brew event during Art-A-Whirl® will be held at the 612Brew at the corner of Central and Broadway in Northeast Minneapolis from Friday, May 18 to Sunday, May 20. In addition, 612Brew is proud to partner with headlining act, the Big Wu, as the official VIP beer sponsor of Revival Fest at Harmony Park Music Garden, in Geneva, MN, the weekend of May 25-27, 2018. More details can be found at https://revivalfestmn.com. 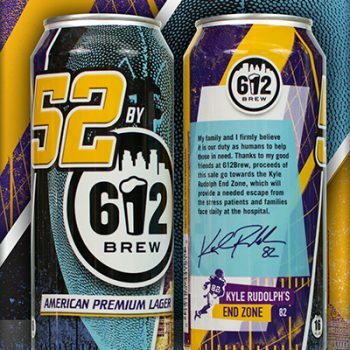 612Brew is a small independent brewery, building its roots in the Northeast Park neighborhood of Minneapolis. The 612Brew leadership team is Robert Kasak, Adit Kalra and Jamey Rossbach, with GABF Medal-winning brewer Austin Myhran at the helm. For more, visit www.612brew.com.